Coltair is the personal name from which the surname Ó Coltair (Coulter) is derived. Slievecoiltia is the highest hill in the South Wexford area and the 1233th highest in Ireland. 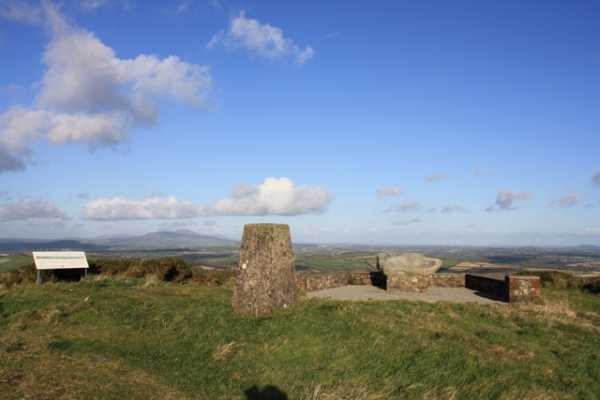 Slievecoiltia is the most westerly summit and also the second most southerly in the South Wexford area. The summit area is a pleasant grassy field next to the car park. Stunning views are available in all directions. As Sunday was a lovely clear day I could see Hook Head Lighthouse, Waterford City, the Comeraghs, the Galtees (85 kms away),Slievenamon, the Blackstairs, Brandon Hill, and a host of minor hills and villages. There were many people about enjoying their Sunday outing and one of them, an elderly man, came over to chat. He must have seen my gps unit as I was busy capturing the summit info for MV. He introduced himself as Danny Burke who used to work for the Ordnance Survey of Ireland. We enjoyed a great chat as he explained about the work he used to do. He told me that in the 1960s he was one of many staff that were sent out to find and rediscover the many hundreds of Trig Points that had been used in the original ordnance survey. He said that these were only clay tablets in the ground and he described the difficulty and adventure in seeking them across the country in often terrible conditions. They then built the modern trig pillars in their place that we see today, which they used for their new survey. Of further interest was that he said the measurements were done at night, with people on each summit using bright helium lights to be visible to other surveyors up to 40 kms away. I thought this was fascinating stuff and it really brought these anonymous concrete pillars to life for me. I considered some of the trig pillars I had seen buried in forests and gorse that had slipped into obscurity, probably never to be used again. With modern technology they would now be as defunct as the original clay tablets Danny referred to.